The First world War, or the Great War as it was known during an immediately after, continues to exercise a draw on the modern imagination. The centenary anniversary of the ceasefire has just passed, and with it much talk of the impacts , effect and @meaning' of the first world war. 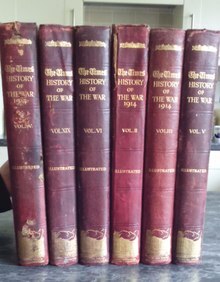 Conversely perhaps, given that its further back in history and thus further back in the public imagination, the Great War produced a literature and a legacy in the written word unmatched in later , and ever deadlier conflicts. Arguments over poppies still linger. The middle east crises grew largely out of problematic resolutions to the war. In Ireland, the legacy of the war ( and the interaction with the 1916 Rising in particular, has proved fertile ground for novelists and historians alike. The dramatic 'modern' nature of mechanized warfare produced shock throughout a Europe expecting a short, decisive conflict, or a minor struggle in the manner of the many short Balkan wars that had preceded it. The belief of 'over by Christmas' that led the cries in July and August 1914 came to be seen as the lies they were. Attempts to open other fronts , in Salonika, Italy and the Dardanelles, also failed. The immense naval struggle in the North Sea, as encapsulated at Jutland in !916, was another 'draw' . As stalemate and deadlock lasted all attempts to break it - even the final German offensives of 1918 and the last Allied offensive failed to move the front lines much before the final armistice. The roots of future conflict were sown in that Germany came to see itself as wronged by the peace, and the Allies sought to draw financial reparations at an unprecedented scale.